We love Alfredo. 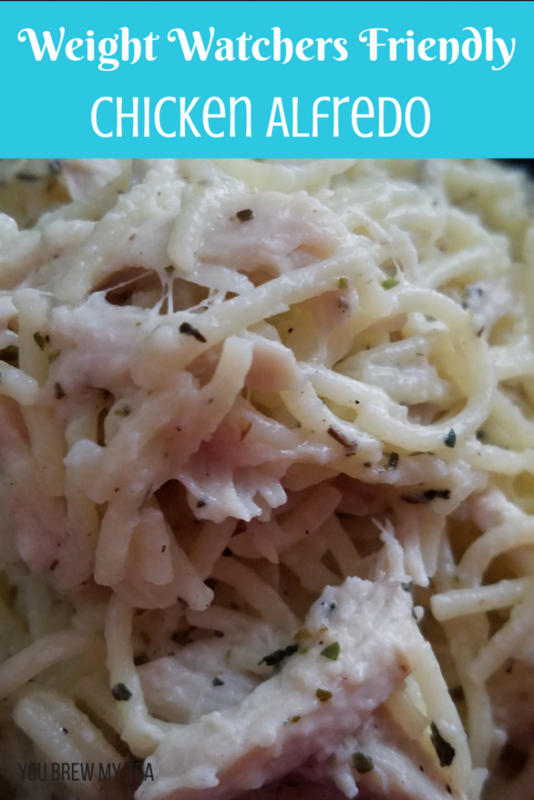 You’ve already seen a few versions here before, but this Weight Watchers Chicken Alfredo Recipe is one that we really love and know tastes delicious. The Wee Child, specifically, really loves alfredo dishes, so finding one that the whole family could enjoy was important. Even though I don’t eat meat and dairy these days, I love having a family friendly option on hand. This post contains affiliate links. I may earn a small commission on purchases made through these links. This Chicken Alfredo recipe contains just a few simple ingredients. One of which is Laughing Cow cheese. We love this for snacks but found it melts beautifully on pasta and really makes this a great choice for a healthier recipe the whole family loves. 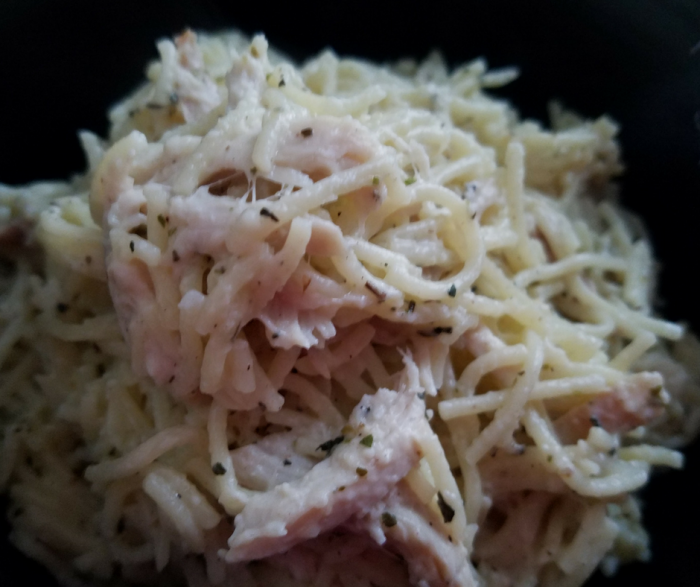 I also love using angel hair pasta as it makes me feel like I am getting more pasta. Cook angel hair pasta according to package directions, leaving slightly al dente. Drain and set aside. In a large saucepan, over medium heat, combine water, cheeses, and seasonings until cheese has melted and a sauce begins to form. This won’t be a traditional sauce and will be a bit lumpy and should take only 3-4 minutes. Add in chicken and pasta and use tongs or pasta fork to combine well so that all pasta is coated. Add black pepper to taste. Cook for additional 2-3 minutes or until chicken is heated through. Over medium heat, combine water, cheeses, and seasonings until cheese has melted and a sauce begins to form. This won't be a traditional sauce and will be a bit lumpy and should take only 3-4 minutes. 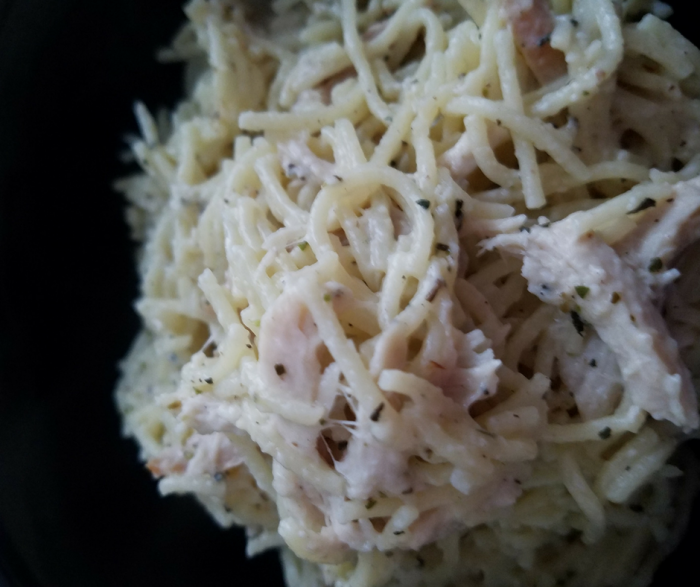 The serving size for this is a bit smaller than my normal pasta dishes, but with the addition of the chicken, it is pretty satisfying. I personally recommend mixing in some broccoli, peas, or asparagus to the dish, and making it a 1 1/2 cup serving for the same points value. A nice side salad or steamed vegetable will also give you a great satisfying meal your whole family will enjoy! This Weight Watchers chicken alfredo recipe is going to be a favorite last minute meal you can whip up in no time. If you are also a fan of lower points on your pasta, then check out the Carba Nada products for a 3SP serving of pasta instead of 5-6!